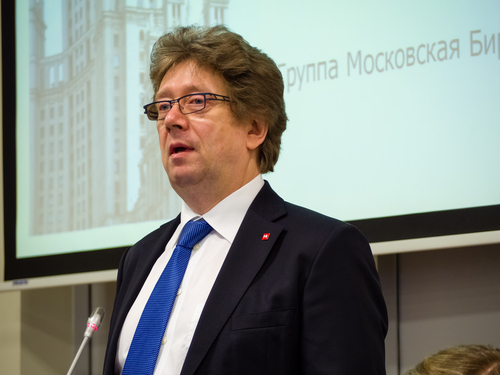 The CEO of the Russian trading floor Moscow Exchange has suggested to Russian MPs that his company – and the wider country – should utilise its position as the third largest producer of gold in the world and offer gold to investors as an alternative to the US Dollar. Russia is notorious for its unhappiness with the Dollar, and President Putin has repeatedly criticised the USA for its behaviour surrounding the greenback and telling Parliament last year that “the monopoly of the US dollar is not reliable enough, it is dangerous for many”. Alexander Afanasiev, CEO of MOEX, spoke to the State Duma (lower house of Russia’s Parliament) last week, saying: “We know that there are a number of super conservative investors who bought the US Dollar and kept the money under the pillow, thinking that it is the safest option out there. “Now, it is time to offer an alternative to people who are looking for safety when investing. “Let’s offer an alternative to the US Dollar in the form of Russian gold, which will be produced here”. Russia has been working over the last two decades to increase its gold reserves, with repeated hints about moving away from the US Dollar as the bulk of their reserves. In our article on January 23 we reported the new figures that Russia had grown its reserves to 8.8 million troy ounces from 7.2 million in 2017. There are some analysts who doubt Afanasiev’s proposal, arguing that gold lacks the same practical uses as a reserve asset when compared to the US Dollar – a lack of liquidity being the main concern. Another point to consider is the Moscow Exchange’s performance compared to the Saint Petersburg Exchange. The latter had a huge client increase in 2018, rising from 7,000 at the start of the year to 46,000 investors by December – an increase of 557%. Trading volume also rose, which in turn increased turnover from $453 million in January 2018 to $1.1 billion by November 2018. The Moscow Exchange was planning to copy St Petersburg, but has yet to do so, and the idea of dissuading people from the US Dollar could be a way of clawing back some of the trading gains made by the rival exchange.